I'm still in my right mind, I think. School starts a week from today. Someone else acting the fool does not give you free license to act the fool. Me. I've been saying some version of this to Sis3 since she learned how to walk. She's about to turn 16 and it hasn't quite sunk in yet. Someday it might. Peace and quiet. It doesn't come to the house often but I'm glad when it does. The kids (even Isaiah somewhat) seem to have resigned themselves to my randomly accosting them to look through their hair for nits. And they weren't nearly as upset about the second round of shampooing either. I just had to deal with their usual level of hair washing angst. Friends from far come near. The drunken sots brawling in the streets at three o'clock in the morning will quickly be buried under piles of course work once classes begin. Sherry A. mother of some refreshingly thoughtful and responsible young adults and teenagers. Hopefully more to come next week. All three of our toilets were out of commission today. None of the tanks would hold water. They had actually been that way for a few weeks but we had been keeping the water turned off until we needed to flush. Hey, it conserved a lot of water. Anyway, with guests due to arrive on the doorstep in just few hours I couldn't procrastinate any longer. So I took apart the guts of all three toilets and took what I thought were the offending parts to the hardware store with me. I bought some parts that I thought would fit based on what I had with me. Then I rushed home to install them. In about 10 minutes I had put the guts back in to all three toilets with no extra bits left over. As of this posting they all seem to be in good working order. Not an errant trickle from a tank can be heard. Yeah me! Something went right for once, after going wrong of course. I didn't have to burn anything to get rid the head lice. I could just wash/dry and/or spray everything. The kids still seem to like me even though I had to comb their hair with a nit comb. They are a little cautious about me getting to close to their heads though. Hubby didn't complain when I gave his hair the once over for head lice. Hubby didn't complain when I had him shave his beard as a precaution against spreading any more lice. I don't know if it was really necessary but why take chances. The washing machine and dryer haven't given out from the near constant use since Wednesday night. So the long and short of it is that Ethan picked up a case of head lice in summer school. Hubby and Sophia got head lice as well. Isaiah hates having his head touched so I don't know if he really had any head lice but I treated his hair anyway. I treated myself as well but I didn't find anything in my hair when I combed it out. So far I seem to be the only one who didn't have any lice. Now You Can Track Who Doctors Wiki Entries! You might have suspected it, and ignored it until now in your online life: Wikipedia isn't the most reliable reference. It's just often the first source to come up when you do an online search. Now a new Web tool offers proof that you shouldn't use Wikipedia to write your school reports or compile biographical facts about your favorite singer (without checking elsewhere as well) because the company or the band you're researching is likely to have enhanced or polished its Wikipedia image. It isn't illegal. The whole point of the online encyclopedia is that it is collaborative and multi-sourced. Well meaning people can be so annoying sometimes. Especially those times when they try to comfort you but are really just trying to comfort themselves. Especially when they ignore the reality of your life that you are trying to share with them to offer comfort to you which is really comfort to themselves. Me: (pointing to a tree on the page) What colour is it? Me: (giving Sophia the I know you know this but I'm asking him look) Isaiah, what colour is it? It's...(still looking expectantly at Isaiah), orange! In case you miss the significance of this exchange after blurting out the answer Sophia then essentially tried to prompt Isaiah to answer my question. When he didn't take the bait she modeled the correct response for him. She's a budding therapist. Sophia: (running down the driveway towards me with her arms wide open) Mommy! Sophia: (just before she plows into me) I know. I made ice cream at home today for the kids. What fun! The boys weren't too freaked out by the noise of the ice cream maker. It is an old electric model that some friends from church gave us and it is loud. I think next time I crank it up I'll have to put it out on the back porch because after two batches the noise had me on edge. I made lactose free blueberry ice cream with thawed berries for my first batch. For the second batch I threw in some homemade strawberry jam that a friend gave us. Yum. In her recent post, Black Talk Radio, Marrying White, and Natural Allies La Shawn Barber blogged about this AP article, More Black Women Consider 'Dating Out': 'Could Mr. Right Be White?' More Black Women Follow Stars' Lead, Consider 'Dating Out'. The article on the changing relationship habits of black women features links to blogs such as Black Female Interracial Marriage: E-Zine on black women and interracial marriage options. I had visited this blog once before after reading about it in another post by La Shawn. I was, and still am, a bit puzzled that someone (and apparently several someones) would dedicate an entire blog to offering encouragement to black women who form relationships with non-black men. Facebook has a new addition called Scrabulous. It lets you play scrabble with your Facebook buddies. It's great because the kids can't wander by and knock over the board. I'm currently being trounced by hubby in our first game. I don't expect to pull off a surprise win either but I am totally hooked. There's gonna be a rematch. Update: The final score was 260 to 228 in hubby's favour. The rematch has already begun. Update 2: Second game was 280 to 219 again in hubby's favour. I've got to find some easier prey for this game. Hubby's mind is just too well suited for this kind of game for me to have any hope of beating him, yet. Hubby reports that he is in the 130s for a page count and getting ready for some major rewriting/editing/whatever. December job market here we come! You scored as Augustus, You are Augustus! First emperor of the Romans and one of the greatest statesmen in the ancient world. You brilliantly eased the old Republic into the Principate and set the path for an empire that would last for centuries and form the underpinnings for all western civilization. Hail Caesar! I found these at Bits and Pieces. Jason BatemanWho's Your 80s Hunk? You have a full life off your computer - and the internet is just a small pastime.Are You Addicted to the Internet? Refrigeration. I really don't need to explain that do I? I married into the geek squad. I've always got someone to give me the low down on techie gadgets and gizmos. Sophia: "Mommmmmy!!! Take me to the bathroom!" She's started just going by herself in the last day or two. 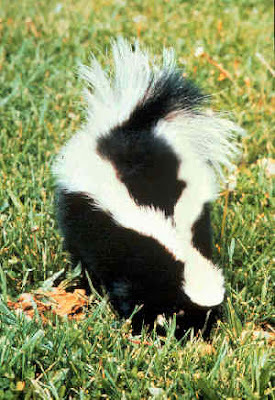 I got this photo from the Wikipedia entry on skunks. Someone or something keeps irritating the local neighbourhood skunk(s). There seems to be a thriving population in the woods on the steep end of the drumlin a couple of streets uphill from my backyard. The resultant stench is driving me nuts. Many a night in the last two and a half weeks I have had the pleasure of falling asleep with the aroma of skunk stuck to the roof of my nasal passages. On a bad night it almost feels like the smell is seeping into the underside of my brain. I try to tell myself that it doesn't smell all that bad but really, it does. I'd like to find whoever or whatever is bothering the skunk(s) and lock them all in a nice airtight room (with CO2 scrubbers to prolong the experience for all of course).